Well, I am feeling pretty old lately, so I thought it would be fitting to make the font Old Lady Swag. I certainly do have the old lady swag - that is for sure! I am having back surgery tomorrow. A discectomy to be technical. I am in a ridiculous amount of pain! As I sit here counting down the minutes until I can take my next dose of medicine, I wonder why I waited so long to have the surgery!? Because I just couldn't bring myself to leave my kiddos! Especially before the holiday! I am so sad, but I am even more sad that I haven't been able to lift or get on the floor with my kid in at least two months! It is just terrible! My kiddos decorated it with sticky rhinestones, because let's face it, if I have to rock a cane at 32 years old, then it needs to be blinged out! My kids did the colorful ones!! Also, my first experience in a hover wheel motorized scooter at Costco and at Target, were interesting!!! The target one was the most embarrassing because it has the back up beep. You know what I am talking about, as you hit reverse it sounds like a massive 18 wheeler backing up. It is by far the most embarrassing thing I have ever gone through in my life. Bad enough I have to be on this thing, but then it beeps when I back up! My gosh! I was ten kinds of mortified! 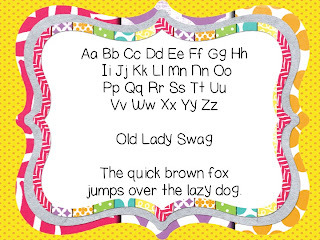 So, the first person to comment will get my old lady swag font for free! Oh no! I hate to hear about your back surgery, but hopefully it will bring some much needed relief! You can recuperate over Christmas break...:) It sounds like you are having a great year and enjoying your kiddos!